Presenter formation in 2018 took place at the House of Prayer from 26 February to 2 March and was led by Jill Benet and Brenda Bayne. 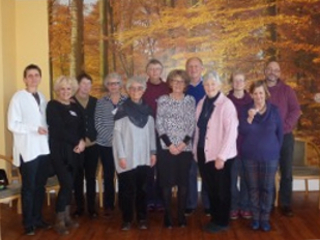 The attendees were Claire Carruthers, Sebastian Harries, Peter Bone, Val Harding, Jayne MacGregor, Judy Lown, Julia Richmond and Teresia Hasanova. Teresia Hasanova had already completed the training in 2016. This year she attended the training to become a trainer and prepare people in the Czech Republic to teach the method of Centering Prayer. She has been really faithful to her practice and Centering prayer is growing in Prague and the surrounding area and in Slovakia. If you are in Prague and would like to “sit” with the group at the Cathedral contact Teresia. At the House of Prayer we formed such a close community we forgot to take a photo, but below you will find a description of the week below as written by Peter Bone, one of the participants. In February 2018 the so-called “beast from the east” froze the country and deposited the deepest snowfalls seen for many a year. 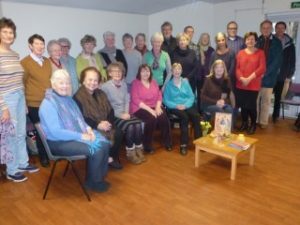 At the same time, eight students and two leaders were “holed up” at The House of Prayer in East Molesey for a Centering Prayer presenters course. Some braved an occasional walk outside despite the weather forecast promising temperatures which would feel like -11oC. A few of us just stayed inside! How would I describe our five days being prepared to deliver the introductory talks? The words intensive, hard-work, tiring and challenging come readily to mind. But we were also affirmed, inspired and encouraged as we learnt how best to present the method of Centering Prayer. The curriculum was pretty straightforward. Namely each of us presented each of the four parts of the introductory course, always led off by either Jill or Brenda. After each talk, the presenter reflected on how they felt about it, and each of the listeners offered a brief critique too. This may sound rather scary, but the comments were kind and affirming and learning points delivered in a helpful way so they could be heard and received. On reflection, I can see how very generously and graciously we were held throughout the five days. Held by the warm hospitality of The House of Prayer, where the food was good and the heating system able to keep us warm despite the icy winds which battered us. Held by the kindness, enthusiasm and know-how of our leader Jill Benet and her assistant Brenda Bayne. Held by the pop-up community and new friendships which were formed. Held by the wisdom of the well-honed material we were training to deliver, the initial authorship presumably from the pen of Thomas Keating. And held by the practice of Centering Prayer that we shared together morning and afternoon in the prayer room. And so it was that, as well as being affirmed, inspired and encouraged I also came away even more excited about Centering Prayer. It offers a spiritual path which is rooted in the historic Christian tradition but which feels wonderfully contemporary as well. It is an accessible and, ultimately, transformative way that leads to personal experience of the Divine, rather than a set of beliefs about the Divine. A way that leads to relationship and knowing first hand, rather than second-hand experience and a set of propositional truths. And that’s good news irrespective of which bit of the church (or not) you come from! The snowfall was greatest on the Friday that we completed the training and, with some having a long journey, a number stayed on to enjoy The House of Prayer’s hospitality for a little longer, preferring this to being stranded on a freezing station or stuck in a snow drift. It is with great sadness that we have to pass on the news that Fr. Thomas Keating, the founder and much-loved spiritual guide of Contemplative Outreach died on October 25th 2018 at the age of 95. For the last 34 years he has laboured unceasingly to make the contemplative life available beyond the confines of monastic walls, believing that divine transformation is the vocation of all of us. He has inspired us not only through his retreats and publications but also by his simple presence. In addition to being the centre around which Contemplative Outreach circled he was very active in the field of inter-spiritual dialogue. We mourn his loss but in the hope and expectation that his light will continue to shine on the global community he founded as it grows in love. A full appreciation of Fr. Thomas’ life can be read on the US website where there are also links to obituaries in the New York Times and National Catholic Reporter. The monks of St. Benedict’s Monastery will be co-hosting a memorial service in Denver, Colorado on Friday, November 16th at 11:00am, local time. This service will be live-streamed by the Centre for Action and Contemplation so you can participate anywhere in the world. The video runs in the UK from 18:00 – 19:30 GMT and can be accessed here. It has been a great disappointment to us to lose the services of Jim Walker (pictured) who represented Contemplative Outreach in the Brighton area for a number of years following the creation of this Chapter. The trajectory of Jim’s life has taken him to Eritrea – yes that is right, Eritrea. His wife was given a placement there and Jim went along too. Last we heard he was teaching Centering Prayer to some nuns in Asmara and chanting the Psalms with them – in English! Such are the twists and turns of a contemplative vocation. I once asked Jim if he had a favourite Thomas Keating quote. At the time he said not but a long while later he came back with “When we pray, we pray for everyone past, present and to come, the whole of creation”. In other words, there’s no such thing as solitary prayer. He may be totally off-grid electronically but he is still deeply connected to all of us through the Spirit. We thank Jim for all his hard work and wish him every blessing in this new phase of his life. Jim’s place on the South Coast is taken by Rev. Guy Partridge whose details appear on the “Who We Are” page. Guy recently qualified as a Centering Prayer Presenter having travelled to Dublin to train with Fionnuala Quinn, the International Coordinator. We are looking forward to working with him. The remit of Contemplative Outreach is very simple. It is to teach the method of Centering Prayer and support those that practice it. The method can be learnt at an all day workshop or a series of shorter sessions that cover all the topics of a workshop. A shorter-still version is a “taster” where the very basics of the practice are offered so that you can get a sense of what Centering Prayer is about and how to get started in the practice. A longer experience may be had by attending an Introductory Weekend. Even though many of us may have read about Centering Prayer and are already practising it according to the instructions given in most books written about it, the benefits of attending an introduction in person is that our questions can be answered. We will have in front of us a committed practitioner who has the experience to be able to affirm and reassure us that in spite of what we might think we are on the right track. The simplicity of the method of Centering Prayer can be difficult at first to accept. In the light of this, and in order to maintain the integrity of the practice, Contemplative Outreach from early on developed a programme to train individuals to “present” the Method of Centering prayer. Over the last eighteen months, Contemplative Outreach London has hosted two training weeks at the House of Prayer at East Molesey and nineteen people have been trained. Over the last few years another three people have attended training weeks held in Dublin hosted by Contemplative Outreach Ireland. If you are interested in knowing more about Presenter Training and the requirements needed in order to take part please contact Jill Benet. 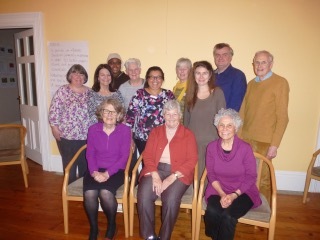 The first training week (February 15 – 19, 2016) was led by Sr. Fionnuala Quinn, currently the Contemplative Outreach International Coordinator and Jill Benet, currently London Coordinator. Participants at the 2016 Training Retreat. Fionnuala Quinn, Debbie House, Denise Moll and Iain Macfarlane. Looking around unsuccessfully for a taxi at Hampton Court Station, I noticed somebody else on the same mission and we discovered we were both going to the House of Prayer. As there were no cabs, we got our exercise walking briskly for 20 minutes plus to Seymour Road. I’d made it from Eastbourne. My fellow-pilgrim had come down from Inverness but we completed the last lap together and were in time for lunch. This was the start of a wonderful week of happy encounters. There were ten of us on our way to being Presenters-in-Training. Fionnuala, the international co-ordinator, and Jill, our London co-ordinator, very gently took charge and together we blossomed. Our gathering was ecumenical. The South-East was well represented but people had come from further afield, from Norwich, Yate, Inverness and the Czech Republic. This was certainly an intensive experience of Christian Community. We all wanted to be able to present Centering Prayer with integrity. Of course our own practice is key and we are all very familiar with the Guidelines; but presenting them to a group is something else. 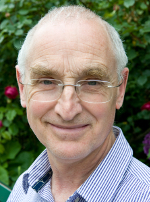 Thomas Keating and his collaborators have provided well-honed teaching materials. Fionnuala and Jill modelled the programme and we each had the opportunity to make our presentations in a small group and to everybody. Feedback from self, group members and our trainers followed. This whole process was a special grace for each person. We grew in competence and confidence. We grew as people and in our understanding and appreciation of each other, and the need to develop a contemplative stance in life. And it wasn’t all work. We had fun making community too. We received guidance and more materials to help our deepening understanding of what we and Contemplative Outreach are about, its communication in life and to others when we are invited to do so. We are grateful for the inspiration we have received and the efforts of so many down the years which has brought it to us. The community at the House of Prayer looked after us beautifully. This also is a home of silence, solitude, simplicity and service. Thank you again, very much indeed. The second week (February 27 – March 3, 2017) was led by Fionnuala Quinn and Jill Benet joined by Brenda Bayne, an experienced facilitator and Presenter from Chichester. Participants at the 2017 Training Retreat. Seated from left: Jill Benet, Fionnuala Quinn, Brenda Bayne. “The fundamental goodness of human nature … is an essential element of Christian faith. This basic core of goodness is capable of unlimited development.” So writes Fr Thomas Keating in ‘Open Mind, Open Heart’. And, judging by my experience of our Centering Prayer Presenters’ training course which took place recently under the wonderful guidance of Sr. Fionnuala Quinn OP and Jill Benet at the House of Prayer, it rings very true. Never have I been dragged so profitably out of my comfort zone and come to realize the value of it so clearly. With no time to waste, we had to present the carefully drawn-up four sessions of an Introductory Day to Centering Prayer to the other members of our two groups, nine of us in all, and open ourselves to their scrutiny. It was not a comfortable thing to do…. but great experience nevertheless. And the ‘fundamental goodness of human nature’ shone through and bonded us swiftly into a team of loving souls who worked quite beautifully together. The anxiety and the fatigue were worth it. The work of the course was interspersed with two periods each day of meditation and some wholesome meals which nourished and maintained us. Then. . . plop, dear Jill dropped another jolly event into our programme – a social get-together for the last evening. Could we muster the energy? Yes, we could only too well and it was a lot of fun. It enabled us all to release our tensions before hitting the hay for the last time. New knowledge, new experience……… . Thank you, all, especially Jill, Fionnuala and Brenda for your love and wise guidance. Over the last year Fionnuala Quinn, the International Coordinator for Contemplative Outreach, has visited us twice at Westminster. The primary reason for her visits to the UK has been to help us train Presenters of the Method of Centering Prayer but as part of each visit she joined in and led our prayer meeting at the Hinsley Rooms in Westminster. In February 2016 she was accompanied by Grace Padilla who set up Contemplative Outreach in the Phillipines and shared with us her experience as a coordinator and how CP is flourishing there. On the same occasion Fionnuala gave an inspiring talk to the group on The Development of Centering Prayer. We are fortunate that Fionnuala has allowed us to share the content of this talk; you can read the text by clicking on the link at the bottom of this post. of the Westminster prayer group. Sr. Fionnuala Quinn is a Dominican Sister. She was born in Ireland and as part of her vocation found herself living in New Orleans for many years. It was there she discovered the practice of Centering Prayer through the work of Basil Pennington. 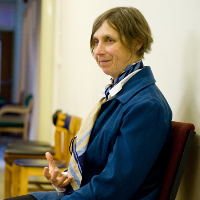 She was trained by Contemplative Outreach in the US and when her order brought her back to Dublin she founded Contemplative Outreach Dublin where she has been energetic and generous in sharing the practice and training others to do the same. Three years ago she was given the post of International Coordinator for Contemplative Outreach. This was the first time this post has been held by someone from outside the US. She has done a wonderful job of training people and offering support all over the world except in the Spanish-speaking countries of Central and South America where they have formed their own body called Extension Contemplativa. Since becoming International Coordinator, she has established a relationship with the leadership teams at Contemplative Outreach Ltd., contributing to their monthly calls. She has raised awareness of the difficulties and needs of groups and individuals living at a distance from the main source of training and support materials. She has also been able to tell them about the growth and enthusiasm for the prayer outside the US. She has been very supportive of our work in the UK and other parts of Europe. In the last four years individuals from the UK, Austria, Poland and the Czech Republic have been trained in London and Ireland to present the method of Centering Prayer. Her next port of call will be in the autumn when she has been invited to offer training to enable the groups in Trinidad to grow. Willing to go wherever she is called, Fionnuala “gets on with it”, faith-filled and as authentic as ever. We wish her every blessing on the journey! 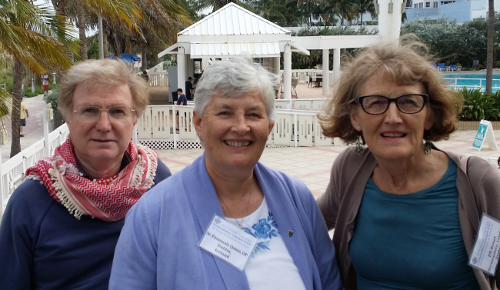 On behalf of the members of Contemplative Outreach in Southeast England Jill Benet and Steve Pearce went to Miami at the end of September to attend the Annual Conference of Contemplative Outreach. Under the title “30 Years of Grace and Gratitude” this was held to celebrate the 30th anniversary of CO in conjunction with Extension Contemplativa Internacional, the Spanish language branch of the network which began in the US and has subsequently spread all over Central and South America. The full conference was attended by about 170 delegates from all over the world including Britain, Ireland, Canada and Australia as well as the USA and Latin America. For the enrichment day a further 100 people from the Florida area joined us. On the first morning we had three lectures on deepening the practice of each of the three supports of the contemplative life: Centering Prayer, Lectio Divina and the Welcome Prayer. During these talks CO President Gail FitzPatrick-Hopler introduced a prayer of the breath – being aware of your breath, breathe in God and breathe out love. This was also mentioned the following day by keynote speaker Fr. Bill Sheehan, another founder member of CO. In his version you breathe in acceptance and breathe out surrender; he also pointed out that you can do this for a few quiet seconds at different times throughout the day. On the subject of the discipline of Centering Prayer he had this to say: “People on retreats used to say to me that they always did their first sit of the day but the second one was often impossible to fit in. When I was young and foolish I used to reply, ‘Do the best you can.’ Now I’m old and crotchety I feel it’s a crime; get your priorities right.” After telling us of the chapter of accidents that lead to his being at the first ever Centering Prayer retreat in 1983 Fr. Bill projected us into the next 30 years pointing out that it is the delegates at the conference who will be responsible for carrying it forward. 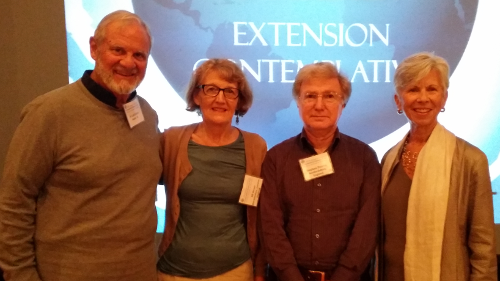 He drew our attention to the fact that, after 30 years of the teaching of Thomas Keating a new generation of teachers and writers is emerging to continue the Christian Contemplative Tradition, mentioning Cynthia Bourgeault, Martin Laird and Kess Frey. His encouragement, enthusiasm and lifelong dedication to all those who practice Centering Prayer was wonderful and inspiring. Every session of the conference was bracketed by a period of chanting led by Marú Ladrón de Guevara who had a vocal style that reminded us both of Joan Baez. There were Spanish and English lyrics to every chant which we sang turn and turn about. Contemplative Outreach in the USA is now on a cusp where founder members Carl Arico and Gail FitzPatrick-Hopler are looking to pass the torch on. It is entering a new period of discernment about it’s future organisation. The Circle of Service is to be divided into a smaller body responsible for governance (i.e. defining overall policy) and another for management (i.e. implementation of the policy). J. David Muyskens, who was wonderfully supportive during the creation of Contemplative Outreach East and South East England, is passing the post of International co-ordinator to Fionnuala Quinn who has always given us sound advice. 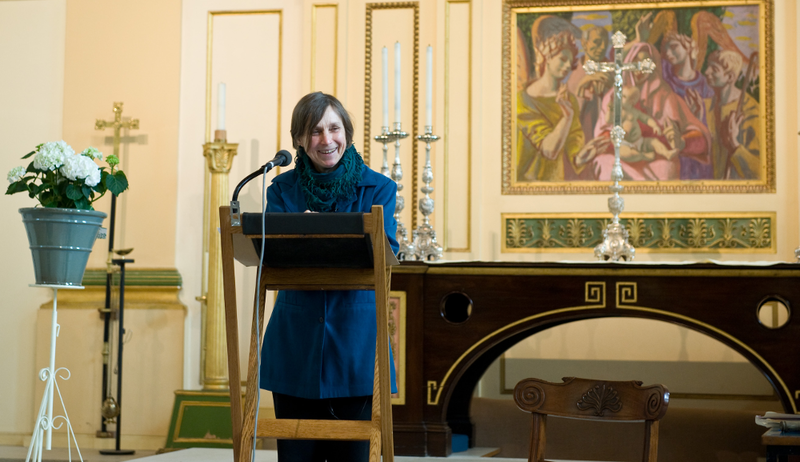 Fionnuala has been very active as a Regional Coordinator for Ireland over the last 7 years and for many years before that was part of the Centering Prayer movement in New Orleans where she lived. Now based in Dublin she has trained and supported many new presenters and Centering Prayer continues to grow throughout Southern Ireland. We look forward to working even more closely with her and benefiting from her expertise. Some changes have been made to Centering Prayer teaching materials. Those who are familiar with the 6-week follow up to the Introductory Day will find that these DVD’s are no longer being reproduced. They are replaced by the videos from the Centering Prayer Training Course which is available from Sounds True (soundstrue.com). Alternative materials have also been recommended for use on retreats; we will give more information about this as it becomes available. The Welcome Prayer booklet from the Contemplative Life Program has also been newly updated. On the evening of the enrichment day we were shown a new film about the life of Fr. Thomas called “Thomas Keating: A Rising Tide of Silence”. It was made by his nephew, Peter C. Jones, over a period of 10 years and is very moving and beautiful. As always Fr. Thomas teaches and inspires throughout. The DVD is available from the US website (contemplativeoutreach.org) but we shall have some viewings in London shortly. The Cloud of Unknowing: Centering Prayer and the Foundations of Unitive Consciousness. The quotations below should help to give you some of the flavour of her three talks. The prayer of The Cloud … is the key source of the method of Centering Prayer. Over the years … the practice of the prayer has been informed by other streams of Christian contemplative practice … but still The Cloud of Unknowing is the immediate source of Centering Prayer. This is a core text. Because you come to know The Cloud in a different way when you’re actually doing the practice … it’s possible to understand what the author … is talking about in a much more subtle way than academic scholars and even historians of religion have picked up. What we have learned from our practice of Centering Prayer can help us to unpack and understand what may be difficult and confusing in the instructions in The Cloud… In a compatible way the instructions in [the book], once we can read them – and decode them – according to our practice, give us profound, new and deeper resources to encourage us along the radical path of transformation that Centering Prayer is. The only thing that’s really lamentable and disgraceful from the point of view of spiritual work is the distracted nature of our attention and our society is full of it to-day. Everything in our culture is set up to “grab our attention” … and that weathercocking attention is basically useless spiritually. What you’re finding here that is embedded in The Cloud is very sophisticated teaching on the placement of attention … through the withdrawal of attention from objects – even holy objects. [In Centering Prayer we] practice the letting go motion with the thing we have in constant supply – our thoughts; and as we practice with our thoughts and as we practice with this letting go … we begin to discover that it does create gradual but very definitive changes in the way we are able to be in the world. …It actually helps us to put on the mind of Christ and participate in the transformation of the structures of our own consciousness. Even though you may have sat there daydreaming your way through eighteen of the twenty minutes of Centering Prayer, the one moment you catch that and let it go you are in the Garden of Gethsemane and you are in solidarity with Christ. What we have in The Cloud of Unknowing completely undetected by scholars is the description of the transition from one kind of consciousness – separated consciousness – into another kind of consciousness – non-dual perception, which is what he means by “contemplative work”.